Driscoll’s point is that “speaking truth to power” has its origins in anti-war pacifism, and Blue Intrigue apparently agrees. Nonetheless, the meaning of the phrase has morphed. Now speaking truth to power just means saying something those in authority don’t want to hear. Can we successfully speak truth to power? I have my doubts. As Driscoll points out too often those who would speak truth to power have the power. Moreover, they do not necessarily speak the truth; their words can be mere sophistries designed to manipulate. When I was a boy, I enjoyed playing with toy soldiers. I suppose that for a similar reason I also enjoyed watching ants march across the landscape. Their order and discipline awed me. Of course, being a boy, I could not leave well enough alone. As the master of my own little universe, I contrived to pit ant colonies in warfare with each other. Then I watched the agonies of their conflicts in fascination. 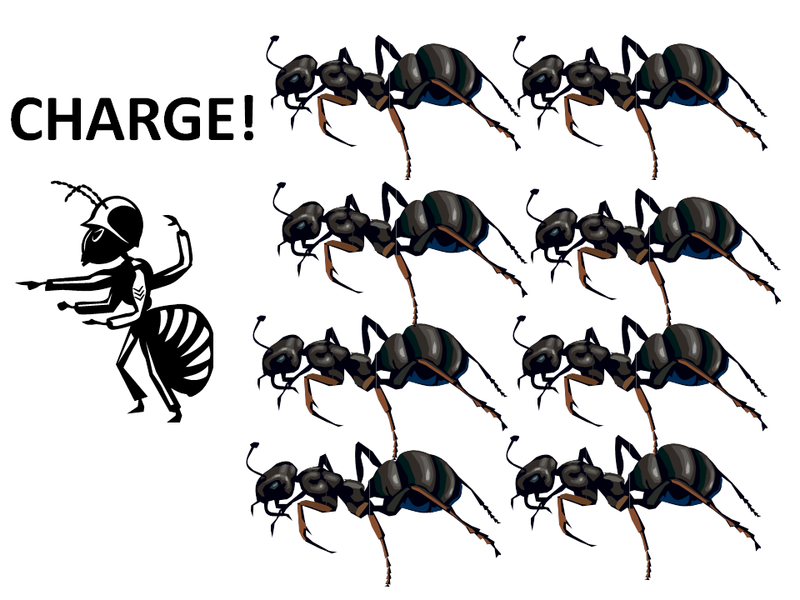 Although the ants were not entirely helpless, there was little they could do. To the ants I was the “power.” Could those little ants speak truth to me? No. So I made them my toys and amused myself. Similarly, the powers that be in our society can be overwhelming. Even when the principalities, the powers, and the dark rulers of this world can hear our words, too often they don’t bother to listen. The puny wisdom of tiny ants means little to them. Just as ants are enslaved by their instincts, we are enslaved our sinfulness. Just as I manipulated the instincts of the ants in my backyard to trick them into fighting each other, the principalities, the powers, and the dark rulers of this world manipulate us far more completely through our wrathfulness, our greediness, our slothfulness, our pridefulness, our lustfulness, our enviousness, our gluttony…. How Can We Speak Truth To Power? So what can we do? We can plead our case to a higher authority. We can speak the truth about redemption from sin (see WHEN DO THE PEOPLE STEAL THEIR OWN FREEDOM?). As Ephesians 6 explains, we can “put on the whole armour of God” (verse 11). With our own wisdom we cannot bring peace, but the word of God is the gospel of peace (verse 15). When we take our case to God, even though we remain subject to the governing authorities, we rest the security of our souls in God’s hands. How does this work? That is a mystery, but the Apostle Paul had no illusions about the “divine right” of kings. He just understood God to be God. Although the principalities, the powers, and the dark rulers of this world may be evil, God has the power to ensure all things work together for good. Even though we may see no material reward in this life, we have the peace of knowing we will receive a great blessing in the next. Therefore, when obedience to God requires us to defy the principalities, the powers, and the dark rulers of this world, we will have the faith and the courage to do so. FREEDOM FOR EVERYONE EXCEPT FOR THE PEOPLE WHO PROTECT OUR FREEDOM? As an aside, ANTZ is worth watching. Woody Allen once commented that he thought that this was his best role, and despite his making this comment rather tongue-in-cheek, many (including me) agree with it. It pits a sort of communist monarchy against a plotted military coup-d’etat, with government intrigue, kidnapping, torture, a politically-staged war and two different genocides in the mix. Thousands of dead are pictured, and a number of on-screen deaths (including significant characters played by big-name actors) are featured. It is perhaps the largest collection of big-name actors in any animated feature, with Woody Allen, Sharon Stone, Gene Hackman, Sly Stallone, Christopher Walken, Dan Aykroyd, Jane Curtain, Anne Bancroft, Jennifer Lopez, Danny Glover and others. Communist slogans are played for laughs, to greater effect if you are familiar with their origins. In other words, not quite typical of kids’ fare. It is one occasion where Dreamworks far outdid their Pixar rivals (who released A Bug’s Life a few weeks later), though as you know I am a keen fan — one of the world’s biggest — of Pixar’s entry into the science fiction genre. I have not bothered to watch a movie in years. Maybe I need to make a few exceptions. I typically see one to three movies a year. And I do not watch television, as a general thing (though my Lady has it on in another part of the home). Nor am I a Woody Allen fan — I’d seen only one other film of his, and that was something like four decades ago. ANTZ struck me as very well-done, and WALL•E had an impact that is still working itself out five years later. Among other things, it turned me from an SF short-story dabbler to a novelist. As you know, there has been much evidence of that sort of influence. A notable example is Communist China’s large investment in Bill Clinton’s campaign, starting in 1991 but looming large in 1996. They received many returns for their millions of dollars, including Clinton shutting down the world’s largest deposit of low-sulphur coal in September 1996. This was the Escalante Grand Staircase deposit in Utah, which he confiscated and turned into a 700,000 acre national monument — locking up a trillion dollars’ worth of this highly valuable coal and making the mining companies’ leases worthless. The second largest deposit was that of Communist China’s Lippo Group, placing them in solid control of this resource. Another payback involved missile guidance, and was an episode I had some involvement in. The impeachment effort for these Chinese activities was coming far along (and fought bitterly by Waxman and others) before being distracted by Monica Lewinsky. It seems to me that “speaking truth to power” is telling someone (with potential power over you) something they don’t want to hear. While the origin of this phrase is evidently within my lifetime, the concept is old — and it is politically (and sometimes physically) dangerous. And it seems ridiculous to me to have this mantle donned by such as Barbara Boxer at your first link — she was applauded for her attack on Condoleeza Rice by those she cared about, and was under no actual threat. It is no more “courageous” than someone like Jodie Foster or some second-rate sports figure “outing” themselves as gay these days. But speaking truth to power can have a positive outcome, and in one story it links to a related notion: In Clavell’s novel Shōgun: The prisoner sea-captain Blackthorne is telling powerful Toronaga (a thinly fictionalized Tokugawa) about a European revolution, and Toronaga is outraged: “There can be no excuse for revolution!” Blackthorne, not cowed, replies: “Unless you win.” This strikes Toronaga just the right way, he roars with laughter and agrees, and the two men develop an odd and respectful relationship that is a key to the rest of the book. In our situation, we can expect little agreement, and no laughter. Our job, as the conservatives who give voice to the desire for a return to Constitutional principles, is not just to “speak truth to power” … but to win. The improvements will be revolutionary. I enjoyed reading your comment. Thank you. I found the video clip from ANTZ quite interesting. Obviously that’s a movie with something to say about our culture. Children’s entertainment seems to have a knack for that. To capture the child audience, it seems that their parents have to be entertained too. I have read Clavell’s novel, Shōgun. That’s a fascinating tale. James Clavell wrote some good books. What is the Christian approach to speaking truth to power? I suppose I did not provide an explicit explanation. Nonetheless, I think you capture a large part of it. As you did, we can point to the sins of our leaders, the men and women our people chose to lead. We can enumerate the unconstitutional abuse of government powers. We can point to the results, the waste and threaten bankruptcy of our nation. But the Christian cannot stop there. We must see the failures of our government as only a symptom, not the problem. We must call for national repentance and a revival of the Christian faith. Will we win? To win this revolution we must capture the hearts and souls of our fellow men. To make the Constitution work, our nation must once again honor the beliefs of the men who wrote the Constitution. Only God can give us that kind of victory. It’s probably worth considering, when you are writing, whether you are explicitly leaving me out of this restoration of Constitutional principles. There are many like me — serious non-theist conservatives who agree with those of deep faith on most points (probably to the same extent that they agree with each other). Many of my friends can be counted in this number, and are keenly interested and willing to work toward the restoration of the US to the wise principles upon which it was founded. Those principles included an easy, comfortable, non-hostile relationship with Christianity. The panic over every mention of God in a public setting is a relatively recent fabrication, and is greatly at odds with the words and deeds of Jefferson and other founders, and with the acts of our government in its early legislation and jurisprudence. Would I worry about “offending” others of different faiths, or those of no denomination at all like myself? No. Taking offense is a voluntary act; it is what a person decides to do about a situation, not the situation itself, that gives rise to offense. Many people lead with their chins, so to speak, looking for an excuse to be offended; we have no Constitutional mandate to protect such people from their own reactions. And it seems to me that people spend much public time being offended, and too often about the wrong things. Abortion? Again, the federal government should not be in this business, and it is the sort of thing that should be determined at the state level. A number of other questions can be settled this way — note that even murder is not a national crime, and its definition varies somewhat state-to-state. I have no problem with a display of the Ten Commandments, though Judge Moore’s actions were rather ham-fisted in some respects. This list is indeed an important part of our Western heritage, and their display should offend no one. Nevertheless, assertions that God is the only possible way to restore the country seem to leave me and similar folk behind. Not that you “need to be more inclusive”; you can, of course, say whatever you wish and it is your show. I submit to you that a nation consisting of a majority like me would produce a result that you and other Americans of deep faith would find eminently satisfactory. I encourage you to keep that in mind, if you would, when deciding what the only possible solutions could be to restoring the country to the principles that guided it early on. Keith – When I say that to make the Constitution work our nation must once again honor the beliefs of the men who wrote the Constitution, that is what I believe. If I think your soul is in jeopardy because you do not believe in God, does saying nothing about it show how much I care or don’t care? I seriously doubt you would respect an indifferent silence. Because you are not a Christian, have I disowned you as a valued ally? No. Although you are not a Christian, I know you support the moral principles that that document rests upon. Because of how you were raised, apparently, you acquired a Christian moral outlook. What I find unusual is that you are quite familiar with the Bible. Nonetheless, the fact you don’t have faith in Christ Jesus does not surprise me. Even the most devoted Christian struggles with doubt. Since you know well what is in the Bible, how you deal with that struggle is between you and God. All I can do is pray. In order to be righteous, do I believe a man or woman has to be a Christian? No, and the Apostle Paul apparently did not think so either. 12 The Gentiles do not have the Law of Moses; they sin and are lost apart from the Law. The Jews have the Law; they sin and are judged by the Law. 13 For it is not by hearing the Law that people are put right with God, but by doing what the Law commands. 14 The Gentiles do not have the Law; but whenever they do by instinct what the Law commands, they are their own law, even though they do not have the Law. 15 Their conduct shows that what the Law commands is written in their hearts. Their consciences also show that this is true, since their thoughts sometimes accuse them and sometimes defend them. Does the Bible provide the one and only way to know God. No. We can know God through His creation and through our conscience. Nonetheless, BECAUSE OF WHAT THEY BELIEVE AND DO NOT BELIEVE, when non-Christians try to operate a constitutional republic, they will for the most part fail. Although non-Christians may have the right instincts, that is all they have, and the temptations of the flesh are mighty. You know that as well as I do. Isn’t that’s why you have observed that Christianity is a force for good? You probably know far more about history than I. You probably know more about religion than I. The historical record goes back 10,000 years. We have had thousands of religions. Throughout history slavery has been the norm. The Athenians and the Romans produced democracies, but even within their democracies half the population existed in servitude. For some reason, the United Kingdom and then the United States abolished slavery. I think that reason was Christ Jesus. I think the difference is this. Religion is incoherent bedlam. Religion consists only of man seeking God. On the other hand, Christianity is God seeking man. To those who accept His teachings, Christ Jesus brings reason and order. Nonetheless, BECAUSE OF WHAT THEY BELIEVE AND DO NOT BELIEVE, when non-Christians try to operate a constitutional republic, they will for the most part fail. Although non-Christians may have the right instincts, that is all they have, and the temptations of the flesh are mighty. This suggests a hypothesis: Non-Christians have done worse than Christians in the care and feeding of the United States’ Constitutional principles. Observation: Apparently not. Almost everyone who has presided over and contributed to the loss of these principles has been Christian. Thus, I don’t think the hypothesis is supportable, as people (non-theist to Christian) each seem quite capable of pursuing other agendas which may conflict with the idea of a free-market Constitutional republic. Sad, but quite evident. And, as an aside, a few of the key founders had philosophies rather similar to my own (or at least closer to me than to you), hence works like the Jefferson Bible. This is most evident from Adams’ and Jefferson’s letters to each other. Each accused the other of being atheists during their bitter campaign in 1800. Decades later, after old wounds healed, they each suggested privately that this was a fair description of themselves. Almost all US political leaders make frequent references to God publicly. But you’d hardly call Barack Obama a devout Christian (nor would I), as he made plain in his writings that adopting a religion was done for politics and for convenience. Still, he invokes God’s help often. It is not a reliable channel-marker. Many of the founders were, of course, quite devout — though in some cases the religion was not very close to modern Christianity. In other cases it was, of course — but it does not seem to me to have been the magical ingredient. There was, indeed, something wondrous and inspired in the ultimate result (though the process was messy enough). It is to that result, the best system of government ever yet devised, that I am dedicated. I think it is important to be gracious and friendly to the religion from whence many of our principles came, but it does not seem so crucial to me to adopt the personal creeds of some of the founders to the exclusion of others. You and I each have done so, of course; one has a single personal creed at a time — mine has been lifelong. We’ve just modeled our thinking (inadvertently) on different founders. My position is the minority, certainly, but what of that? So how far apart are we on this topic, in reality? The only difference is whether being a Christian should be considered mandatory to re-establishing and maintaining the US’s guiding principles. I don’t see evidence suggesting that it is, and see the insistence that Christianity is the only way as (1) something of a distraction, and (2) leading in many cases to hostility toward people (like me) who would be allies. On most conservative forums, I don’t discuss religious issues, as even mentioning my own non-theism tends to cost me the audience. It is disappointing to me. Of course, on liberal forums any disagreement with anything on the left generally gets me banned. That’s a rather different world. The “Conservatism” forum on LiveJournal has been populated for years by conservatives and liberals arguing points. The equivalent “Liberals” forum does not allow non-liberals, period.